Schematic reconstructions. 17 Feb 2013. © Dag Klaveness. Wikipedia. Unknown. © Copyright free. Published in: Hay, W.W., Mohler, H.P., Roth, P.H., Schmidt, R.R. & Boudreaux, J.E. (1967). Calcareous nannoplankton zonation of the Cenozoic of the Gulf Coast and Caribbean-Antillean area, and transoceanic correlation. Transactions of the Gulf Coast Association of Geological Societies 17: 428-480. This is the type species (holotype) of the genus Emiliania. Named for Thomas Henry Huxley (1825-1895), British scientist. Airs, R.L. & Llewellyn, C.A. (2006). Improved detection and characterization of fucoxanthin-type carotenoids: novel pigments in Emiliania huxleyi (Prymnesiophyceae). Journal of Phycology 42: 391-399. Bendif, E.M. & Young, J. (2014). On the ultrastructure of Gephyrocapsa oceanica (Haptophyta) life stages. Cryptogamie Algologie 35(4): 379-388. Bendif, E.M., Probert, I., Carmichael, M., Romac, S., Hagino, K. & de Vargas, C. (2014). Genetic delineation between and within the widespread coccolithophore morpho-species Emiliana huxleyi and Gephyrocapsa oceanica (Haptophyta). Journal of Phycology 50(1): 140-148. Cook, S.S., Jones, R.C., Vaillancourt, R.E. & Hallegraeff, G.M. (2013). Genetic differentiation among Australian and Southern Ocean populations of the ubiquitous coccolithophore Emiliania huxleyi (Haptophyta). Phycologia 52(4): 368-374. Cook, S.S., Whittock, L., Wright, S.W. & Hallegraeff, G.M. (2011). Photosynthetic pigment and genetic differences between two Southern Ocean morphotypes of Emiliania huxleyi (Haptophyta). Journal of Phycology 47(3): 615-626. Eltgroth, M.L., Watwood, R.L. & Wolfe, G.V. (2005). Production and cellular localization of neutral long-chain lipids in the haptophyte algae Isochrysis galbana and Emiliania huxleyi. Journal of Phycology 41: 1000-1009. Evans, C., Malin, G., Mills, G.P. & Wilson, W.H. (2006). Viral infection of Emiliania huxleyi (Prymnesiophyceae) leads to elevated production of reactive oxygen species.. Journal of Phycology 42: 1040-1047. Findlay, C.S., Young, J.R. & Scott, F.J. (2005). Haptophyta:Order Coccolithophorales. In: Antarctic marine protists. (Scott, F.J. & Marchant, H.J. Eds), pp. 276-294. Canberra & Hobart: Australian Biological Resources Study; Australian Antarctic Division. Frada, M., Not, F., Probert, I. & de Vargas, C. (2006). CaCO3 optical detection with fluorescent in situ hybridization: a new method to identify and quantify calcifying microorganisms from the oceans. Journal of Phycology 42: 1162-1169. Hagino, K., Bendif, E.M., Young, J.R., Kogame, K., Probert, I., Takano, Y., Horiguchi, T., de Vargas, C. & Okada, H. (2011). New evidence for morphological and genetic variation in the cosmopolitan coccolithophore Emiliania huxleyi (Prymnesiophyceae) from the cox1b-ATP4 genes. Journal of Phycology 47(5): 1164-1176. Harris, G.N., Scanlan, D.J. & Geider, R.J. (2005). Acclimation of Emiliania huxleyi (Prymnesiophyceae) to photon flux density . Journal of Phycology 41: 851-862. Heimdal, B.R. (1996). Modern coccolithophorids. In: Identifying marine phytoplankton. (Tomas, C.R. Eds), pp. 731-834. San Diego: Academic Press. Iglesias-Rodriguez, M.D., Schofield, O.M., Batley, J., Medlin, L.K. & Hayes, P.K. (2006). Intraspecific genetic diversity in the marine coccolithophore Emiliania huxleyi (Prymnesiophyceae): the use of microsatellite analysis in marine phytoplankton population studies. Journal of Phycology 42: 526-536. Landry, D.M., Gaasterland, T. & Palenik, B.P. (2006). Molecular characterization of a phosphate-regulated cell-surface protein from the coccolithophorid, Emiliana huxleyi (Prymnesiophyceae). Journal of Phycology 42: 814-821. Lembi, C.A. & Waaland, J.R., Eds (1988). Algae and human affairs. pp. [i]-vii, -590. Cambridge: Cambridge University Press. Leonardos, N. & Geider, R.J. (2005). Elevated atmospheric carbon dioxide increases organic carbon fixation by Emiliania huxleyi (Haptophyta), under nutrient-limited, high-light conditions. Journal of Phycology 41: 1196-1203. Leonardos, N. & Harris, G.N. (2006). Comparative effects of light on pigments of two strains of Emiliania huxleyi (Haptophyta). Journal of Phycology 42: 1217-1224. Reinhardt, P. (1972). Coccolithen. Kalkiges Plankton seit Jahrmillionen. Die neue Brehm Bücheri No. 453. pp. 1-99, 188 figs. Wittenberg: A. Ziemsen Verlag . Rontani, J.-F., Prahl, F.G. & Volkman, J.K. (2006). Re-examination of the double bond positions in alkenones and derivatives: biosynthetic implications. Journal of Phycology 42: 800-813. Schroeder, D.C., Biggi, G.F., Hall, M., Davy, J., Martinez, J.M., Richardson, A.J., Malin, G. & Wilson, W.H. (2005). A genetic marker to separate Emiliania huxleyi (Prymnesiophyceae) morphotypes (Note). Journal of Phycology 41(4): 874-879. Seoane, S., Eikrem, W. Arluzea, J. & Orive, E. (2009). Haptophytes of the Nervión River estuary, northern Spain. Botanica Marina 52: 47-59. Xu, Y., Wahlund, T.M., Feng, L., Shaked, Y. & Morel, F.M.M. (2006). A novel alkaline phosphatase in the coccolithophore Emiliana huxleyi (Prymnesiophyceae) and its regulation by phosphorous. Journal of Phycology 42: 835-844. Young, J.R., Geisen, M., Cros, L., Kleijne, A., Sprengel, C., Probert, I. & Ostergaard, J.B. (2003). A guide to extant calcareous nannoplankton taxonomy. Journal of Nannoplankton Research Special Issue 1: 1-125. Accesses: This record has been accessed by users 8603 times since it was created. Balch, W.M., Kilpatrick, K., Holligan, P.M. & Cucci, T. (1993). Coccolith production and detachment by Emiliania huxleyi (Prymnesiophyceae). Journal of Phycology 29: 566 -575, 10 figs, 2 tables. Bidle, K.D. & Kwityn, C.J. (2012). Assessing the role of caspase activity and metacaspase expression on viral susceptibility of the coccolithophore, Emiliania huxleyi (Haptophyta). Journal of Phycology 48(5): 1079-1089. Borman, A.H., de Jong, E.W., Thierry, R., Westbrook, P. & Bosch, L. (1987). Coccolith-associated polysaccharides from cells of Emiliania huxleyi (Haptophyceae). Journal of Phycology 23: 118-123. Buitenhuis, E.T., de Baar, H.J.W. & Veldhuis, M.J.W. (1999). Photosynthesis and calcification by Emiliania huxleyi (Prymnesiophyceae) as a function of inorganic carbon species. Journal of Phycology 35: 949-959, 7 figs. Båtvik, H., Heimdal, B.R., Fagerbakke, K.M. & Green, J.C. (1997). Effects of unbalanced nutrient regime on coccolith morphology and size in Emiliania huxleyi (Prymnesiophyceae). European Journal of Phycology 32: 155-165, 7 figs, 2 tables. Colmenero-Hidalgo, E., Flores, J.-A. & Sierro, F.J. (2002). Biometry of Emiliania huxleyi and its biostratigraphic signifiance in the Eastern North Atlantic Ocean and Western Mediterranean Sea in the last 20000 years. Marine Micropaleontology 46(3-4): 247-263. Conte, M.H., Thompson, A., Eglinton, G. & Green, J.C. (1995). Lipid biomarker diversity in the coccolithophorid Emiliania huxleyi (Prymnesiophyceae) and the related species Gephyrocapsa oceanica. Journal of Phycology 31: 272-282, 6 figs, 4 tables. Corstjens, P.L.A.M., van der Kooij, A., Linschooten, C. & Brouwers, G.-J. (1998). GPA, a calcium-binding protein in the coccolithophorid Emiliania huxleyi (Prymnesiophyceae). Journal of Phycology 34: 622-630, 6 figs, 1 table. Davis, S.A., Young, J.R. & Mann, S. (1995). Electron microscopy studies of shield elements of Emiliania huxleyi coccoliths. Botanica Marina 38: 493-497, 4 figs. Feng, Y., Warner, M.E., Zhang, Y., Sun, J., Fu, F.-X., Rose, J.M. & Hutchins, D.A. (2008). Interactive effects of increased pCO2, temperature and irradiance on the marine coccolithophore Emiliania huxleyi (Prymnesiophyceae). European Journal of Botany 43(1): 87-98. Garrido, J.L. & Zapata, M. (1998). Detection of new pigments from Emiliania huxleyi (Prymnesiophyceae) by high-preformance liquid chromatography, liquid chromatography-mass spectometry, visible spectroscopy and fast atom bombardment mass spectrometry. Journal of Phycology 34: 70-78, 4 figs, 3 tables. Garrido, J.L., Otero, J., Maestro, M.A. & Zapata, M. (2000). The main nonpolar chlorophyll c from Emiliania huxleyi (Prymnesiophyceae) is a chlorophyll c2-monogalactosyldiacylglyceride ester: a mass spectrometry study. Journal of Phycology 36: 497-505. Garrido, J.L., Zapata, M. & Muiz, S. (1995). Spectral characterization of new chlorophyll c pigments isolated from Emiliania huxleyi (Prymnesiophyceae) by high-performance liquid chromatography. Journal of Phycology 31: 761-768, 5 figs, 4 tables. Green, J.C., Heimdal, B.R., Paasche, E. & Moate, R. (1998). Changes in calcification and the dimensions of coccoliths of Emiliania huxleyi (Haptophyta) grown at reduced salinities. Phycologia 37: 121-131, 14 figs, 2 tables. Harris, G.N., Scanlan, D.J. & Geider, R.J. (2009). Responses of Emiliania huxleyi (Prymnesiophyceae) to step changes in photon flux density . European Journal of Phycology 44(1): 31-48. Haxo, F.T. (1985). Photosynthetic action spectrum of the coccolithophorid, Emiliania huxleyi (Haptophyceae): 19'hexanoyloxyfucoxanthin as antenna pigment. Journal of Phycology 21: 282-287, 6 figs, 1 table. Holtz, L.-M., Thoms, S., Langer, G. & Wolf-Gladrow, D.A. (2013). Substrate supply for calcite precipitation in Emiliania huxleyi: assessment of different model approaches. Journal of Phycology 49(2): 417-426. Jeffrey, S.W. & Anderson, J.M. (2000). Emiliania huxleyi (Haptophyta) holds promising insights for photosynthesis. Journal of Phycology 36: 449-452. Kegel, J.U, Blaxter, M., Allen, M.J., Metfies, K., Wilson, W.H. & Valentin, K. (2010). Transcriptional host-virus interaction of Emiliania huxleyi (Haptophyceae) and EhV-86 deduced from combined analysis of expressed sequence tags and microarrays. European Journal of Phycology 45(1): 1-12. Klaveness, D. (1976). Emiliania huxleyi (Lohmann) Hay & Mohler. III. Mineral deposition and the origin of the matrix during coccolith formation. Protistologica 12: 217-224. Landry, D.M., Kristiansen, S. & Palenik, B.P. (2009). Molecular characterization and antibody detection of a nitrogen-regulated cell-surface protein of the Coccolithophore Emiliania huxleyi (Prymnesiophyceae). Journal of Phycology 45(3): 650-659, 8 figs, 3 tables. Lecourt, M., Muggli, D.L. & Harrison, P.J. (1996). Comparison of growth and sinking rates of non-coccolith- and coccolith-forming strains of Emiliania huxleyi (Prymnesiophyceae) grown under different irradiances and nitrogen sources. Journal of Phycology 32: 17-21, 3 figs. Lefebvre, S.C., Harris, G., Webster, R., Leonardos, N., Geider, R.J., Raines, C.A., Read, B.A. & Garrido, J.L. (2010). Characterization and expresson analysis of the Lhcf gene family in Emiliania huxleyi (Haptophyta) reveals differntial responses to light and CO2. Journal of Phycology 46(1): 123-134. Leonardos, N., Read, B., Thake, B. & Young, J.R. (2009). No mechanistic dependence of photosynthesis on calcification in the coccolithophorid Emiliania huxleyi (Haptophyta). Journal of Phycology 45(5): 1046-1051. Linschooten, C., Vanbleijswijk, J.D.L., Vanemburg, P.R., Devrind, J.P.M., Kempers, E.S., Westbroek, P. & Devrinddejong, E.W. (1991). Role of the light-dark cycle and medium composition on the production of coccoliths by Emiliania huxleyi (Haptophyceae). Journal of Phycology 27: 82-86. McCarthy, A., Rogers, S.P., Duffy, S.J. & Campbell,D.A. (2012). Elevated carbon dioxide differentially alters the photophysiology of Thalassiosira pseudonana (Bacillariophyceae) and Emiliania huxleyi (Haptophyta). Journal of Phycology 48(3): 635-646. Medlin, L.K., Barker, G.L.A., Campbell, L., Green, J.C., Hayes, P.K., Marie, D., Wrieden, S. & Vaulot, D. (1996). Genetic characterisation of Emiliania huxleyi (Haptophyta). Journal of Marine Systems 9: 13-31. Merrett, M.J., Dong, L.F. & Nimer, N.A. (1993). Nitrate availability and calcite production in Emiliania huxleyi Lohmann. European Journal of Phycology 28: 243-246, 3 figs, 1 table. Nam, O., Shiraiwa, Y. & Jin, ES. (2018). 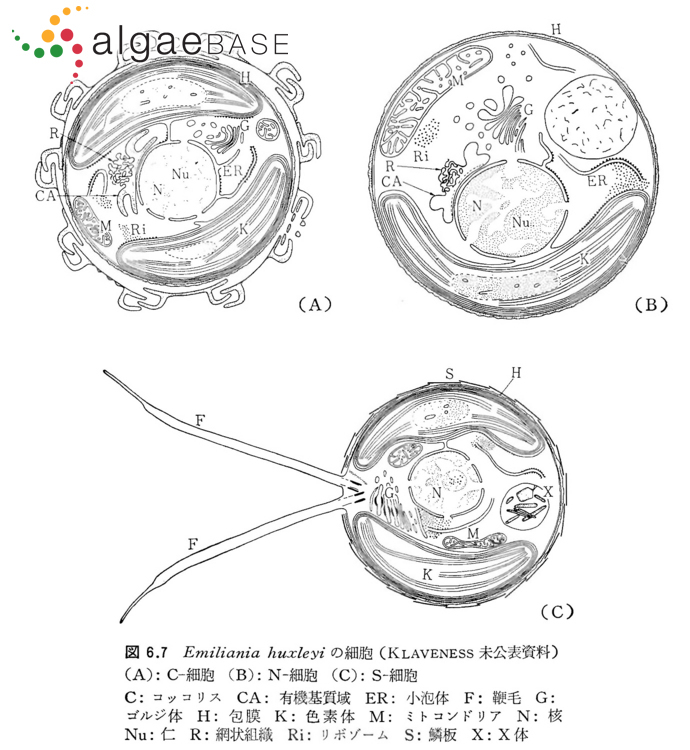 Calcium-related genes associated with intracellular calcification of Emiliania huxleyi (Haptophyta) CCMP 371. Algae. An International Journal of Algal Research 33(2): 181-189. Nielsen, M.V. (1995). Photosynthetic characteristics of the coccolithophorid Emiliania huxleyi (Prymnesiophyceae) exposed to elevated concentrations of dissolved inorganic carbon. Journal of Phycology 31: 715-719, 1 fig, 1 table. Nielsen, M.V. (1997). Growth, dark respiration and photosynthetic parameters of the coccolithophorid Emiliania huxleyi (Prymnesiophyceae) acclimated to different day length-irradiance combinations. Journal of Phycology 33: 818-822, 3 tables. Nimer, N.A., Merrett, M.J. & Brownlee, C. (1996). Inorganic carbon transport in relation to culture age and inorganic carbon concentration in a high-calcifying strain of Emiliania huxleyi (Prymnesiophyceae). Journal of Phycology 32: 813-818, 4 figs. Paasche, E. & Brubak, S. (1994). 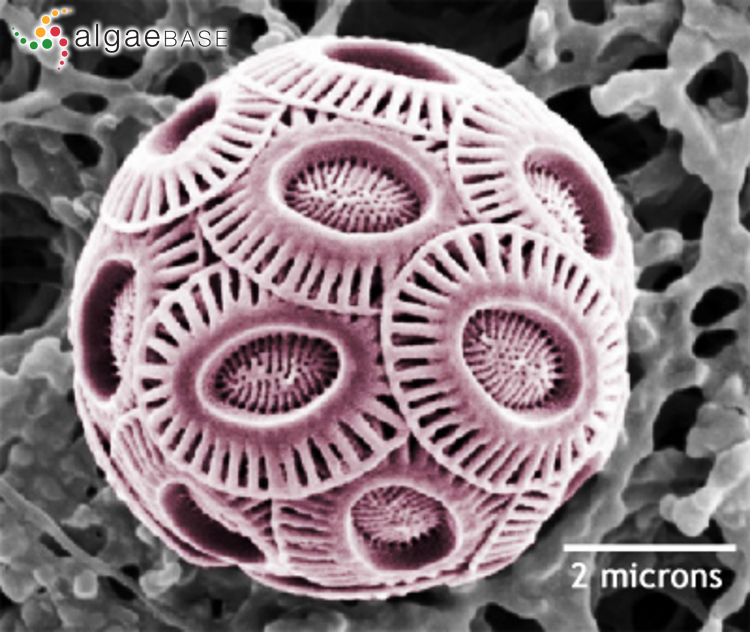 Enhanced calcification in the coccolithophoroid Emiliania huxleyi (Haptophyceae) under phosphorus limitation. Phycologia 33: 324-330, 4 figs, 3 tables. Paasche, E. (1998). Roles of nitrogen and phosphorus in coccolith formation in Emiliania huxleyi (Prymnesiophyceae). European Journal of Phycology 33: 33-42, 15 figs. Paasche, E. (1999). Reduced coccolith calcite production under light-limited growth: a comparative study of three clones of Emiliania huxleyi (Prymnesiophyceae). Phycologia 38: 508-516, 10 figs, 1 table. Paasche, E. (2002). A review of the coccolithophorid Emiliania huxleyi (Prymnesiophyceae), with particular reference to growth, coccolith formation, and calcification-photosynthesis interactions (Phycological Reviews 20). Phycologia 40: 503-529. Paasche, E., Brubak, S., Skattebøl, S., Young, J.R. & Green, J.C. (1996). 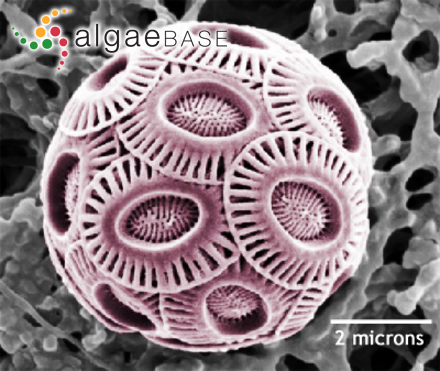 Growth and calcification in the coccolithophroid Emiliania huxleyi (Haptophyceae) at low salinities. Phycologia 35: 394-403, 11 figs, 3 tables. Pantorno, A., Holland, D.P., Stojkovic, S. & Beardall, J. (2013). Impacts of nitrogen limitation on the sinking rate of the coccolithophorid Emiliania huxleyi (Prymnesiophyceae). Phycologia 52(3): 288-294. Ragni, M., Airs, R.L., Leonardos, N. & Geider, R.J. (2008). Photoinhibition of PSII in Emiliania huxleyi (Haptophyta) under high light stress: the roles of photoacclimation, photoprotection, and photorepair. Journal of Phycology 44: 670-683. Riegman, R., Stolte, W., Noordeloos, A.A.M. & Slezak, D. (2000). Nutrient uptake and alkaline phosphatase (EC 3:1:3:1) activity of Emiliania huxleyi (Prymnesiophyceae) during growth under N and P limitation in continuous cultures. Journal of Phycology 36: 87-96. Schofield, O., Bidigare, R.R. & Prezelin, B.B. (1990). Spectral photosynthesis, quantum yield and blue-green light enhancement of productivity rates in the diatom Chaetoceros gracile and the prymnesiophyte Emiliania huxleyi. Marine Ecology Progress Series 64(1-2): 175-186. Stojkovic, S., Beardall,J. & Matear, R. (2013). CO2-concentrating mechanisms in three southern hemisphere strains of Emiliania huxleyi. Journal of Phycology 49(4): 670-679. Stolte, W., Kraay, G.W., Noordeloos, A.A.M. & Riegman, R. (2000). Genetic and physiological variation in pigment composition of Emiliania huxleyi (Prymnesiophyceae) and the potential use of its pigment ratios as a quantitative physiological marker. Journal of Phycology 36: 529-539. Suggett, D.J., le Floc'H, E., Harris, G.N. Leonardos, N. & Geider, R.J. (2007). Different strategies of photoacclimation by two strains of Emiliania huxleyi (Haptophyta). Journal of Phycology 43: 1209-1222.
van Bleijswijk, J., van der Wal, P., Kempers, R., Veldhuis, M., Young, J.R., Muyzer, G., de Vrind-de Jong, E. & Westbroek, P. (1991). Distribution of two types of Emiliania huxleyi (Prymnesiophyceae) in the northeast Atlantic region as determined by immunofluorescence and coccolith morphology. Journal of Phycology 27: 566-570, 5 figs, 1 table. van Bleijswijk, J.D.L., Kempers, R.S., Veldhuis, M.J. & Westbroek, P. (1994). Cell and growth characteristics of types A and B of Emiliania huxleyi (Prymnesiophyceae) as determined by flow cytometry and chemical analyses. Journal of Phycology 30: 230-241, 6 figs, 2 tables. Yin, X., Ziegler, A., Kelm, K., Hoffmann, R., Watermeyer, P., Alexa, P.. Villinger, C., Rupp, U., Schlüter, L., Reusch, T.B.H., Griesshaber, E., Walther, P. & Schmahl, W.W. (2018). Formation and mosaicity of coccolith segment calcite of the marine algae Emiliania huxleyi . Journal of Phycology 54(1): 85-104. Young, J.R. & Westbroek, P. (1991). Genotypic variation in the coccolithophorid species Emiliania huxleyi. Marine Micropaleontology 18: 5-23. Young, J.R., Didymus, J.M. & Mann, S. (1991). On the reported presence of vaterite and aragonite in coccoliths of Emiliania huxleyi. Botanica Marina 34: 589-591, 2 tables. Zhao, Y., Wang, Y. & Quigg, A. (2015). The 24 hour recovery kinetics from N starvation in Phaeodactylum tricornutum and Emiliania huxleyi. Journal of Phycology 51(4): 726-738.